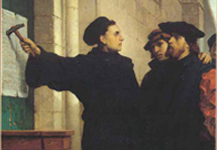 Dead Theologians: Why so many?? 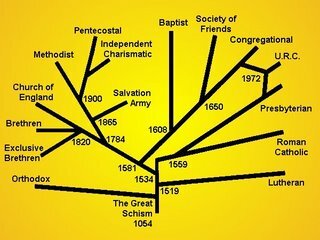 The topic for a little while is denominations. 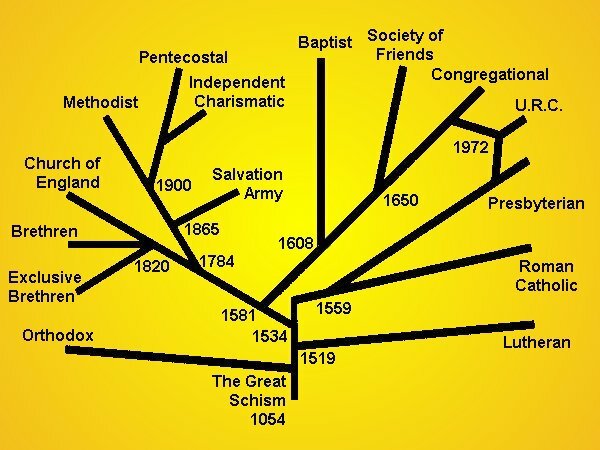 I have often wondered about denominations and why there are so many. I suppose one reason is the doctrinal differences that make up so many denominations. Denominations describe who we are and what we believe. They are like last names in a way. A person would look foolish telling you their name is "Ted" and that is all. You may say "Ted, what?" He would say "Just Ted." His last name would tell you what family he is from and in some areas it might tell you where he resides. It defines who we really are. His family is not the "Ted" family. That just tells you a little about him. His last name would separate him from a dozen other "Ted's" that you might know. That is the way denominations are. They define us. I welcome your input as to what you think and whether you think denominations are a good thing or not. I'm not sure that denominations are either good or bad, but certainly inevitable. I think that were there one "church" with no denominations, there would be factions (secret or open) within that church. It is our nature, as people, to divide into little groups of like-minded buddies. It's tempting to say that denominations are an opportunity to stereotype their membership. But the stereotypes seem to break down very quickly under the press of human contact. For instance, the theological divisions locally [Atlanta metro area] seem to align to geography more than denomination - 'OTP' or 'Outside the Perimeter' vs. 'ITP' or 'Inside the Perimeter'. As Methodists, we seem to get along more with the Presbyterians, who share our commitment to social action, although their worship service would be a bit too staid for most of us. We get along less well with the Episcopalians, whose worship service seems remote and overly mediated. So, I wonder about the tree you've presented, and what it would tell us about ourselves. The controversy over gay rights, gay marriage, etc. has forced us in our church to seek a theological grounding for our tendency to welcome whomever walks in our front door. So, a lot of discussion about who was Jesus, what did Jesus actually say and do. Or the nature of the Old Testament generally, and what is the context that that provides us? In this, we and other 'ITP' Atlanta churches are becoming our own denomination-within-a-denomination. Because we are appalled at the intolerances expressed by our fellow Methodist churches. So, maybe things do align around ideology after al. Ugh. I keep rewriting this. I'll just make it short. I asked Andrew Strom (http://revivalschool.com), "How important is doctrine? ", and his answer was quite helpful for me in distinguishing between heady/academic arguments and things that should be argued for. He said (hopefully quoting accurately) that any doctrine that changes the way you live is important to argue over, but he won't get in an argument if it doesn't make a difference in your life. He gave an example of end times theology, but then said if you were living a lukewarm Christianity based on your belief in the end times, than he would argue, but if you were a solid, on-fire (I forget the words he used here) Christian, and believed differently than he did, he wouldn't get into it. I agree that factions and divisions would occur but how many denominations will it take before the church is no longer the church? "welcome whomever walks in our front door"
I agree that all are welcome to sit and listen to God's Word being preached. BUT, they are not allowed to join unless they are born again.